viewers/readers. 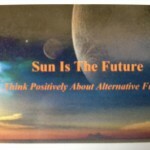 As stated in the card (at right), “Think Positively About Alternative Future” is the goal of Sun Is The Future. So, in this month of November, I’d like to bring you a series of alternative future possibilities, be it in terms of social values, city planning design, or construction of an environment. After viewing BBC News’ recent reports regarding conflicts and protests that’s been brewing in Europe and Middle East, I feel compelled to share with you views of alternative future that will be of abundance, of clean water and air that will free human beings from wars and wants, free human beings from waste and inequality. Regardless which perspective these different views are coming from, they all have the common belief that solar energy will be playing a significant part of this hopeful future. I have always viewed myself as a problem solver, but a year ago I came across a fascinating character who truly epitomizes all the traits of “problem solver” . 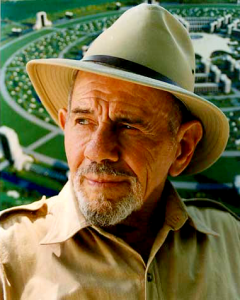 His name is Jacque Fresco, an American self-taught structural designer, architectural designer, concept artist, educator, and futurist. The Venus Project proposes an alternative vision of what the future can be if we apply what we already know in order to achieve a sustainable new world civilization. It calls for a straightforward redesign of our culture in which the age-old inadequacies of war, poverty, hunger, debt and unnecessary human suffering are viewed not only as avoidable, but as totally unacceptable. Anything less will result in a continuation of the same catalogue of problems inherent in today’s world. Today many people believe what is needed is a higher sense of ethical standards and the enactment of international laws to assure a sustainable global society. The Venus Project proposes a system in which automation and technology would be intelligently integrated into an overall holistic socioeconomic design where the primary function would be to maximize the quality of life rather than profit. 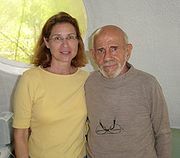 Located in Venus, Florida, The Venus Project research center addresses many of the difficulties we face today and proposes a more appropriate set of values relevant to a sustainable society, with more opportunities and freedoms. If you’d like to see the creation of a radically different society where material possessions are unnecessary, where buildings are created in factories, where mundane jobs are automated, where the main goal of daily life is to improve personal knowledge, enjoy hobbies, or solve problems. Then, check out The Venus Project web site and their campaign at Kickstarter Project page. Be sure to also check out our next post on Tomorrow’s Cities proposed by The Venus Project. This entry was posted on Friday, November 1st, 2013 at 4:43 PM	and is filed under Educational, News. You can follow any responses to this entry through the RSS 2.0 feed. You can leave a response, or trackback from your own site.